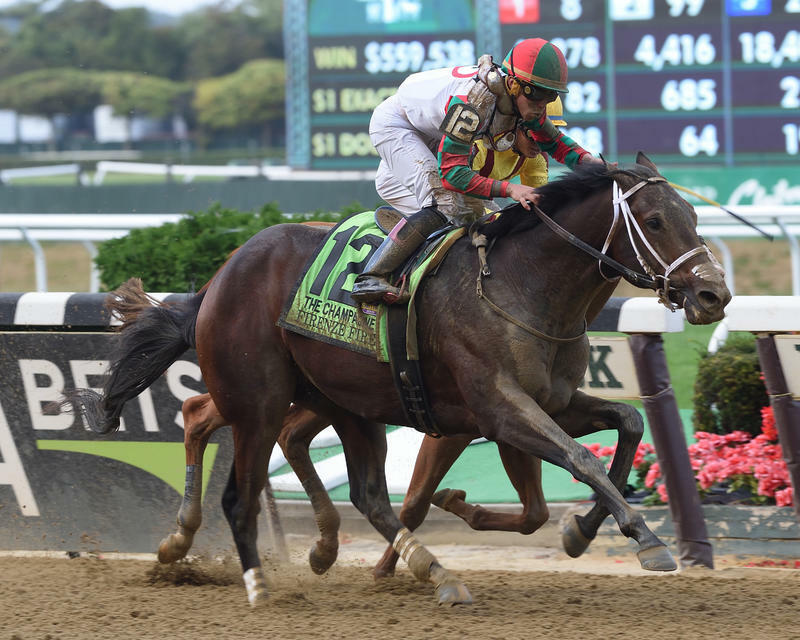 A return to a one-turn mile might give Firenze Fire an edge in Saturday's $300,000 Gotham (G3) at Aqueduct, a Road to the Kentucky Derby series prep that will award Kentucky Derby qualifying points of 50-20-10-5 to the top four finishers. While he's come up short in a pair of two-turn appearances, the son of Poseidon's Warrior owns a four-for-five mark around one turn, including victories in the Champagne (G1), Sanford (G3), and $150,000 Jerome. The latter, contested over a slow-playing muddy track on January 13, proved a grind for the Jason Servis-trained colt, but he was up in time to defeat the Dale Romans-trained Seven Trumpets by a half-length. Last time, Firenze Fire finished second in the nine-furlong Withers (G3) to Avery Island, trained by Kiaran McLaughlin. Both Romans and McLaughlin have major contenders in the Gotham. Romans scratched Breeders' Futurity (G1) winner Free Drop Billy from last week's Fountain of Youth (G2) to run in the Gotham instead. The Union Rags colt was a distant second to Audible in the Holy Bull (G2) in his season debut early last month. A well-beaten Fourth in the Holy Bull as the favorite was Enticed, McLaughlin's Kentucky Jockey Club (G2) hero of last November. While the form of that Churchill Downs feature took a beating in the Holy Bull, third-placed finisher Promises Fulfilled, trained by Romans, made it look a little better when upsetting champion Good Magic in the Fountain of Youth last week. The pace figures to be honest for the favorites with Cove Blue, Old Time Revival, and Nine Route entered. From a class perspective, Old Time Revival might fare best of the speedy trio following a narrow loss in the $100,000 Miracle Wood at Laurel last time. Stepping up in trip for his first race in four months is Beautiful Shot. The California invader won a six-furlong stakes at Santa Anita in October, but was a distant third in the seven-furlong Bob Hope (G3) to future Derby prep winners Greyvitos and Mourinho. The Gotham, which reverts to its former distance after being run at 1 1/16 miles over Aqueduct's now-defunct inner track since 2006, can be watched and wagered on at TwinSpires.com.